The origins of the fortress date back to 1590 when the Spanish King Philip II ordered its construction. Expanded in 1638 by the town governor Pedro de la Roca and designed by the Italian military engineer Juan Bautista Antonelli, it was called Castillo de San Pedro de la Roca del Morro. 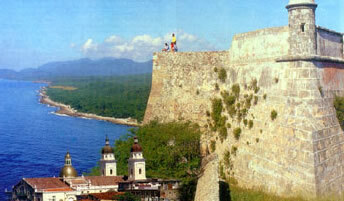 The fortress was part of the defensive system of the important port town of Santiago de Cuba, and it was reconstructed and expanded several times until the end of the 19th century.